A couple of weekends ago, I found this recipe for Chili’s queso. And you already know from my cajun chicken pasta recipe that we are obsessed with Chili’s. Their queso is so amazing that we even pay the extra 50 cents to get it in the 2 for $20 deal. I HAD to try this recipe ASAP! So I set out to find a skillet. After 5 stores we had no success of finding one. On that Monday Sarah posted the same recipe on her site! So now not only is she awesome, she has good taste too! I found the skillet on Amazon, of course and made this delicious recipe. IT IS EXACT. Me and the hubby were in Chili’s queso heaven. We saw a glimpse of our future last night being able to make large amounts of queso at home and living fat and happily ever after. Amazing queso that tastes just like Chili's! Combine the cheese with remaining ingredients in medium saucepan over medium heat. Stir Frequently until the cheese melts. Hi, Thank you so much for following my blog. I am now your new follower!! I can’t wait to try the slow cooker beef recipe, looks yummy. What size iron skillet did you use? Is it best using iron skillet? I used a sause pan to start then I poured it all into our skillet and popped in the oven on a low broil for a couple of minutes. Think I could mix it and then keep it warm in crock pot for party? looks yummy! Can’t wait wait to try it! Can’t wait to try it! Now can you duplicate the chip?! This is awesome! I’m eating it right now. Turned out just right. Tostito’s recently came out with a chip that is pretty close to the Chili’s chips. It’s Cantina Thin and Crispy or something like that. My husband and I both worked at Chili’s a long time ago. Thanks for this yummy recipe! I love Chili’s queso!!! I used to be waitress at the Chili’s in Cambridge and then London restaurants. We had to learn every single ingredient for every single dish on the menu. I will defiantly want to try and make it myself at home, thanks for the recipe! I just wanted to say that the Chili’s queso definatly had meat in it and your recipe doesn’t! Is this because your vegetarian or did not think it had meat in it? Hormel Chili has beef in it. Tried this recently and it was perfect. It really does taste just like Chili’s! If you put any tortilla chips in the microwave for 1 minute on high for a large bowlful, you’ll be amazed at how fragrant, fresh and crisp they taste! Thanks for the awesome tip! We will be trying it!! I just made this and my daughter and I are eating it. It’s really good! Not exactly like Chili’s but close enough. It has a little more heat than the Chili’s version but that is fine with me! Thanks for the recipe! Ok so we went to Chili’s last week and I think their queso isnt as good anymore! My hubby said that he actually likes this version better! 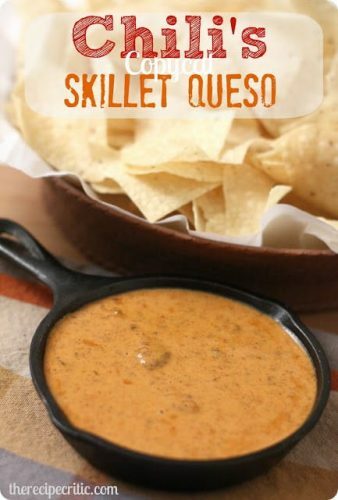 Tried this a few days ago … tastes EXACTLY like the Skillet Queso from Chili’s! So good! Made this today and both hubby and I thought it was a bit too cheesy. Next time I’ll only use 3/4 of the Velveeta brick. Other than that, it was very tasty and very much like the restaurant’s version! I was wondering what size skillet you bought off of Amazon? I was wondering the same thing (about the skillet size) did you ever find out? i was wondering if i dont like Hormel chili can i use wolf brand chili? I thought chilis queso had sausage in it also..the kind like u find on sausage pizza. Yummy yummy in our tummies! It’s been a few years since I’ve had the Chili’s original but this is just as I remember it. The recipe is terrific. I cooked it on medium low so the velveeta wouldn’t burn. If you’re in a pinch for time, I’m pretty sure you could do this in the microwave. I’d suggest stirring it frequently. Can you use a regular pan, does it have to be a skillet? This recipe is great and easy to make. Thank you! So happy I found this recipie! I didn’t use the whole block of velvetta probably about 3/4 of it and I added half of another can of chili. It all depends on your taste preferences. It’s easy to adjust as you go so I would add a little of everything and see how you like it!! It reheats so well too had it again the next day slathered on a hot dog!!! Thanks for the recipie! Has anyone tried this in a crockpot? If so how did it turn out? Yes you can also make it in a crockpot. Also great for keeping it warm on game day. So, at about 3:30 yesterday afternoon, I developed a craving for Chili’s skillet queso. Came out of nowhere. Naturally, I had to look for a recipe. I copied down all the ingredients, but then I got to thinking — I didn’t have any of these spices in my cabinet, so I would have to buy them in order to make the recipe. Spices can be pretty expensive, and it seemed silly to make that kind of investment without trying the recipe first. So I bought a store-brand packet of taco seasoning when I bought my chili and cheese. I mixed in the taco seasoning in the same amounts as listed for the spices above, and then gave it a taste. Phenomenal. I ended up mixing in a little more taco seasoning to taste, and I loved the results. So did my daughter! If you’ve run out of spices and you’re pressed for time, taco seasoning makes a great substitute! Im in heaven! love Chilis queso and this is spot on and even better! Can barely write this comment because I cant stop eating! Made this last night for Game 7 of the World Series – my kids practically licked the pan! Awesome recipe! Next time I would reduce the milk and increase the chili because we like it a little thicker. The flavor was right on! Thank you! This recipe doesn’t taste anything like Chili’s recipe. I just ate there a few days ago and really wanted more, so I used this recipe to make my own. Such a disappointment and now I have a bunch leftover. I’d suggest to definitely cut back on the cheese, too. Do you use regular milk or the canned milk? Hi. My wife and I came over to America in November to visit family. They took us to Chili’s, and we had the Queso. It’s amazing! I want to make your recipe for it, but I don’t think we can get the cheese that they use here in the UK. I will have to look for an alternative. Can’t wait to try it out. Thank you for the recipe. I followed the recipe exact and found it to be way too spicy compared to Chili’s. Next time I would leave out the cayenne and put less chili powder in. Although it was spicier than Chili’s, our kids age 7 & 10 ate it with a glass of milk on the side.